There will be a changing of the guard on April 9, as former U.S. Ambassador to the U.N. John Bolton replaces Lt. Gen. H.R. McMaster as President Trump’s new national security advisor. Bolton is a native of Baltimore, MD and attended Yale University, where he received both his undergraduate and juris doctorate degrees. While many recognize Bolton as a commentator on Fox News, he has a long resume of political and social accomplishments. Bolton is a fellow at the American Enterprise Institute, former policy adviser to 2012 presidential aspirant Mitt Romney, senior adviser to Freedom Capital Investment Management and counsel to Washington D.C law firm Kirkland & Ellis. It’s no secret that Bolton is a hawk when it comes to national defense. One needs to look no further than Bolton’s views on the U.S. invasion of Iraq. Bolton joined other administration officials in expressing confidence that Saddam Hussein had weapons of mass destruction and that Iraqis would welcome the U.S. overthrow of the regime. Wrong and wrong! 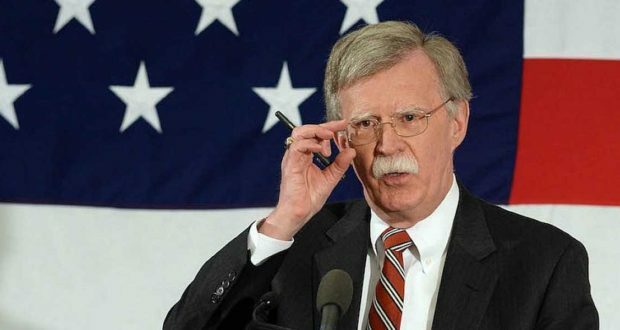 Bolton still defends his position today by expressing that the world is a safer place without Saddam Hussein. President Trump ran for election on a populist/nationalist platform, one in which the United States would assume a more isolationist world view. With that said, it is of interest that he has selected a national security advisor who has proclaimed that a pre-emptive strike on Iraq and/or North Korea could be the right strategic move. Bolton will make sure the Iran nuclear deal is dead, and the threat of a nuclear attack against Israel and our homeland will never happen. Bolton is a steadfast neo-conservative with notably hawkish views. It will be interesting to see how his solid stances on hot button issues as Iran and North Korea mesh with his new boss’ tendencies to make quick decisions that are often unpredictable. Only time will tell. The narrative pushed by the anti-Bush crowd, that Saddam did not have WMD after all, depends on completely ignoring or dismissing (1) a full year of satellite surveillance of semi trucks leaving known WMD factories and crossing into Syria, (2) the testimony of a former Saddam insider who repeatedly said that one of the two “passenger” flights allowed into and out of Iraq had been fitted with equipment, after the seats were removed, to accommodate tanks of materials, which were then routinely smuggled out of the country during the year-long lead-in to the invasion, (3) evidence of different kinds of WMD found in sites known to be WMD factories, but in trace amounts, and (4) evidence of fitting out of missiles Saddam was not supposed to have, to carry material assumed to be MWD in nature. Then, of course, Syria used WMD in its civil war, which was never linked, in the minds of the Left, to the shipments from Iraq. The claim that Bush, Bolton et al were just wrong wrong wrong in believing that Saddam had deadly WMD is wholly based on the small (and to them therefore insignificant and meaningless) traces of WMD in various sites in the country, found after the invasion. They demanded entire warehouses of intact WMD to accept the fact that WMD had, in fact, been manufactured by the Saddam regime and were, in fact, present in the country prior to the invasion. And at the time, when Iraqis believed that we would stand by them after Saddam was gone, many if not most of them DID welcome the invasion. It was only when they were cut loose without protection from retaliation that they had to become anti-American and support the thugs we left in charge, to simply survive. Rejection of the overthrow of Saddam and the eventual anti-American sentiment in the country are the shameful outcomes of our cowardice and abandonment of people we told to trust us.